Built on a century of maritime experience, PureSOx comprises Alfa Laval core technologies and over 50 years of specific experience with marine scrubbers. This is why every PureSOx scrubber ever installed is operating and in compliance today. We can configure a PureSOx system to match not only your sailing profile, but also the physical constraints of your vessel. An Alfa Laval PureSOx scrubber system can be configured in three different operating arrangements – all of which can handle multiple exhaust gas sources. Most customers select a hybrid scrubber, which balances economy with operating flexibility. In a hybrid scrubber arrangement, both open-loop and closed-loop modes are readily available. Open-loop operation reduces costs whenever possible, but a switch to closed-loop operation can be made whenever local water discharge regulations demand it. In an open-loop scrubber arrangement, seawater is used to scrub the exhaust gas. Once the water has passed through PureSOx, it is discharged back into the sea in accordance with legislation. This configuration has the lowest investment and operating costs, but its use may be limited by low water alkalinity or local water discharge regulations. In a closed-loop scrubber arrangement, the scrubber water is dosed with an alkaline additive and recirculated. As it becomes dirty, the circulation water is cleaned, discharged and replenished to retain scrubber capacity. The scrubber can be used anywhere and at any time, but its operating costs are higher. PureSOx Connect simplifies proof of compliance thanks to user-friendly, graph-based reporting. Operators can easily review data on the Alfa Laval Touch Control or via an online portal. The capabilities of PureSOx Connect go far beyond reporting and include additional cloud-based analysis and diagnostic services. Watch this video to learn more. 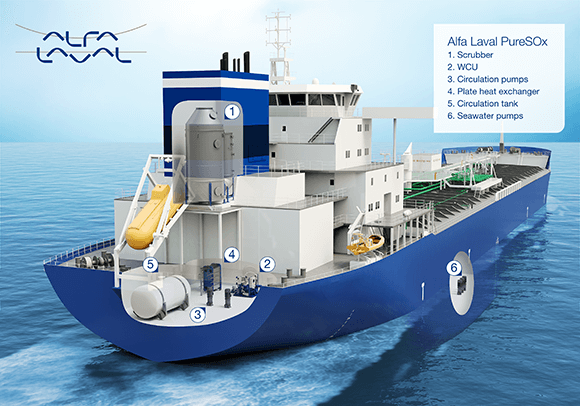 Alfa Laval is at the forefront of marine scrubber technology, having worked with it for over 50 years. PureSOx is continuously being developed, both at the Alfa Laval Test & Training Centre and on board. Alfa Laval has worked with marine scrubbers for decades as part of inert gas production systems for tankers. In addition, PureSOx builds directly on Alfa Laval’s core technologies of fluid handling, heat transfer and separation. Expertise in centrifugal separation – the most reliable method of water cleaning at sea – is especially important for a closed-loop or hybrid scrubber system, where it is needed to ensure compliant cleaning of the circulation water. Much of the ongoing development of Alfa Laval PureSOx occurs at the Alfa Laval Test & Training Centre, a unique research facility located in Aalborg, Demark. With its 1350 m2 testing space, the centre is a full-size machine room on land, with complete process lines integrated around a 2 MW marine diesel engine. The 1.5 MW PureSOx scrubber installed here can be pushed to its limits under controlled conditions, which accelerates both the speed and quality of testing. To obtain shipyard documentation or more information, please contact Alfa Laval.